This is the 800th anniversary of the Battle of Las Navas de Tolosa, known in Arab history as the Battle of Al-Uqab. It took place on 16 July 1212 and was a key point in the re-conquest of medieval Spain from the Moors. The Spanish forces were led by King Alfonso VIII of Castile joined by the armies of Sancho VII of Navarre, Pedro II of Aragon and crusaders from across Western Europe. The Caliph al-Nasir led the Almohad army, made up of troops from the whole Almohad Empire and the Iberian Peninsula. Alfonso of Castile had been defeated in 1195 by the Almohads at Alarcos. The Almohads then captured the towns of Trujillo, Plasencia, Talavera, Cuenca and Uclés. In 1211, Muhammad al-Nasir crossed from Africa and invaded Christian territory, capturing the castle of the Calatrava Knights at Salvatierra. The Pope responded to this threat to the Iberian Christian kingdoms by calling a crusade. 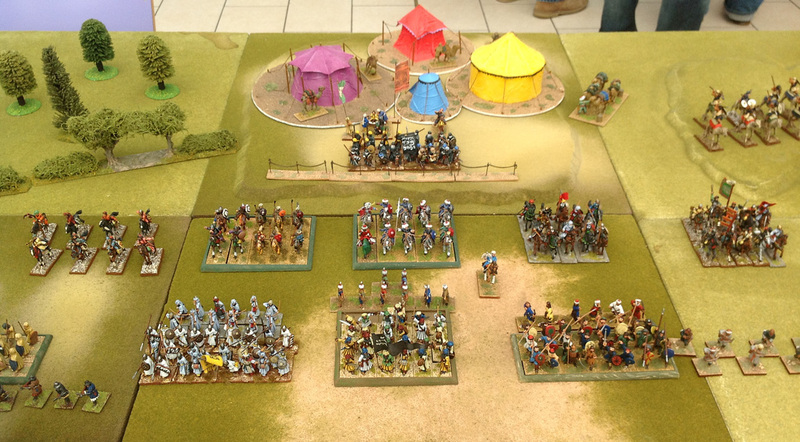 The armies gathered at Toledo. A local shepherd guided the armies through the mountains surprising the Almohad camp. It appears that the Spanish army formed up with the Castilians in the centre, Aragon on the left and Navarre on the right. Repeated cavalry charges failed to break the Almohad line, but their counter-attack was also beaten off by Spanish infantry on both flanks. The Castilian reserves and military orders reinforced both wings and broke through on the left flank. Legend has it that the Caliph had his tent surrounded with a bodyguard of slave-warriors who were chained together as a defence, although it is more likely the chains were a defence against cavalry. The Navarrese led by King Sancho broke through this bodyguard. The Caliph escaped, but the Almohads were routed. As usual with medieval battles, the sources quote huge numbers, but there is little doubt that the Almohads suffered heavy casualties. This diagram is conjectural but is a best estimate. 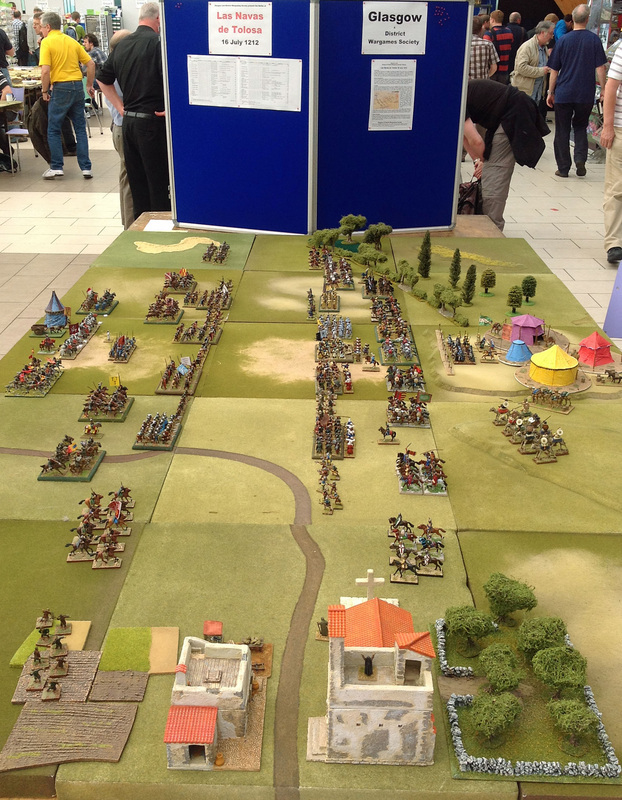 This refight uses Warhammer Ancient Battle rules with figures from a wide range of suppliers including, Gripping Beast, Perry, Old Glory, Crusader and others we have forgotten. From the collections of Dave Watson, Liam Entwistle, Graham Robertson and Andy McGeary. Santiago banners are from Flags of War and buildings are Grand Manner. 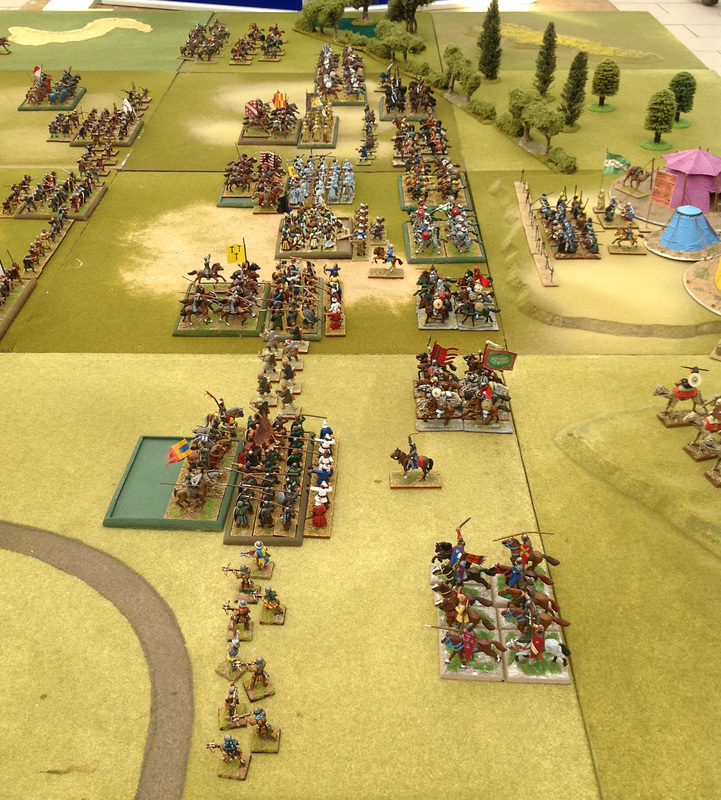 While this is somewhat later than the classic El Cid period, the Warhammer Historical supplement covers the battle. WRG Armies of Feudal Europe remains a good source and there are Osprey MAA 348, 200, and 155 for the usual quality colour plates etc. For a detailed background there is an excellent dissertation available on line “The Battle of Las Navas de Tolosa: The Culture and Practice of Crusading in Medieval Iberia” by Miguel Dolan Gomez.